A vehicle must be failed for WoF if a shock absorber has excessive leakage of damping fluid. 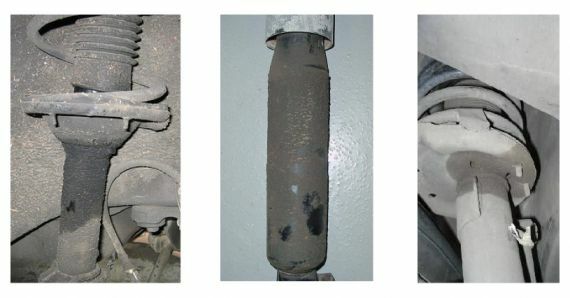 However, it seems that quite a few inspectors are incorrectly failing a vehicle when the shock absorber only displays “misting”. Misting is normal on shock absorbers and must pass for WoF/CoF. By design, the piston rod carries a film of oil through the rod seal to lubricate the seal lips, thereby reducing friction/wear at the seal contact area, and prolonging seal life. Misting occurs when the hot piston rod is drawn out of the shock body and the microscopic film of hot oil on the rod turns to vapour. This vapour, or mist, condenses when it reaches the cooler outside air, and forms a film on the outside of the shock body. The film will attract road dust and debris, and will often coat the entire body of the shock. 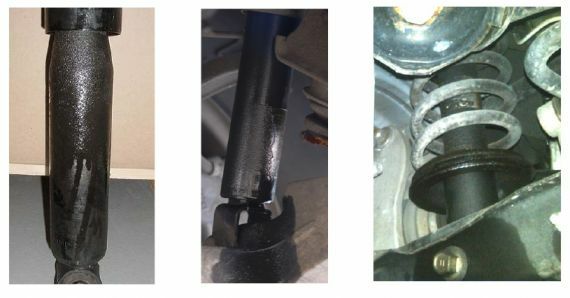 Rod seals may leak as a result of extreme wear, contamination, or defect. A leaking shock will show clear signs of oil leaking in streams from the upper seal down the shock body and may drip from the shock. Such leakage is considered to be excessive and must be failed for WoF/CoF. Note: Some minor streaking of oil may appear on a new shock body during initial stroking. This is the result of the seal “setting” and purging any oil (from assembly) from the seal. This is not to be mistaken as a failure, as it is temporary and totals only a few millilitres of oil. Page added 14 October 2013 (see amendment details).